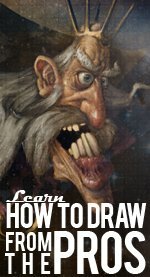 But I know why you're here, you want the inside tips on learning how to draw cartoon characters to help make this learning process as easy on yourself as possible right? Let's get to it! Always use simple shapes to your advantage. You might not yet be great at drawing but I'm sure you can make a good looking square, triangle or maybe even a circle and if you stick to these basic shapes you can create some pretty amazing stuff. So when I say start off the easy way what do I mean? What I mean is: Use the simple shapes to your advantage. You can draw them already without any trouble and if you start to squash and stretch or put them together you'll get a whole lot of interesting shapes. Take a look at these example head shapes. First look at them just as the shapes that you see. Notice how some of them are stretched out, while others like the square are perfect. Just concentrate on the shape for now. Okay, now look at the shapes again and try to picture a face inside each one of those shapes. Think about how each shape could possibly represent a different style of character or even a different personality of character. Perhaps the square headed character is very stubborn and old-fashioned while the egghead character could be simple, slow and clumsy. Begin training your artist's brain how to see between the lines and visualize the possibilities. Start trying to draw in the lines and detail of the faces with your mind. Don't worry if you can't draw what you see in your head just yet  that will come with time. With enough practice you'll be drawing stuff right out of your head with no problem  much to the amazement of anyone watching you draw. Now go ahead and do the exact same thing for the torso -- the stomach and chest. Think about the cartoon characters that you're familiar with like The Simpsons, Naruto, The Family Guy or Calvin and Hobbes. What are the body shapes of those characters like? If it doesn't seem obvious at first find a good picture of your favorite cartoon character, print it out and then try drawing simple shapes on top of the print out and see which shapes fit the best. Are you starting to see the pattern emerge here? The real secret behind learning how to draw cartoon characters is not that you have to be a fantastic artist. The secret is being able to break complex arrangements and designs into simple shapes that anyone can draw. This is the real magic  using your mind to break down and rearrange things into meaningful pieces that you understand. The legs are no different than the other parts of the body. Start from simple shapes, experiment, don't be afraid to make mistakes, have fun and start to learn what works and what doesn't. Take a look at the example legs on this page. Feel free to use them as starting point to create your own cartoon people but promise yourself that you won't get lazy and stop trying to make your own original drawings. Being able to copy is one thing and many people can do it, but being able to create is something rare and magical. So ask yourself this: would you rather be a rare and magical creative, or just a regular, run-of-the-mill copy cat? I hope that by looking closer at the shapes of the things you draw as well as the things you see in the world around you really helps you learn how to draw cartoon characters.